West Coast has previously suggested that, in spite of the Province of British Columbia’s “tough talk” on oil pipelines, it has been trying to pass the decision-making buck to the federal government’s National Energy Board (NEB). A year ago, the Gitga’at First Nation and Coastal First Nations (CFN) sought a court declaration that the provincial government was required to make its own decision about whether to issue a provincial Environmental Assessment (EA) Certificate for the Enbridge Northern Gateway project, and to consult with First Nations before doing so. We thought they had a good argument. It turns out the BC Supreme Court thought so too. In a judgment released January 13, Coastal First Nations v British Columbia (Environment), the BC Supreme Court found that, although BC’s Environmental Assessment Act provides BC authority to cooperate with the federal government to avoid duplicating EAs, BC must nonetheless make its own decision about issuing an EA Certificate. The Court dismissed Northern Gateway’s arguments that BC had no constitutional decision-making role because interprovincial pipelines such as Northern Gateway are federal undertakings, finding instead that regulation of the environment is an issue of shared jurisdiction and thus BC’s EA legislation can apply to federally-regulated pipelines, so long as BC’s legislation does not contradict or frustrate the purpose of federal law. The Court also agreed that BC had failed to consult Gitga’at and CFN. The Court found that BC had no duty to consult when it entered into the Equivalency Agreement that transferred BC’s authority to conduct an EA to the National Energy Board in the first place. This is because the Equivalency Agreement applies generally to EAs in many circumstances and so, in the Court’s view, there was not a clear enough link between BC signing the Equivalency Agreement and specific adverse impacts on Gitga’at’s Aboriginal rights that would require consultation. However, the Court noted that the Equivalency Agreement contained a provision allowing BC to terminate the Agreement (and thus conduct its own EA), and found that BC breached its duty to consult Gitga’at about its decision not to terminate the equivalency agreement for Northern Gateway. The Court’s finding was influenced by the fact that Gitga’at and CFN had raised significant concerns with BC about potential impacts of Northern Gateway on their Aboriginal rights that were not being addressed in the federal process, which were similar to the concerns BC itself raised when it opposed the approval of Northern Gateway, yet BC failed to consult. 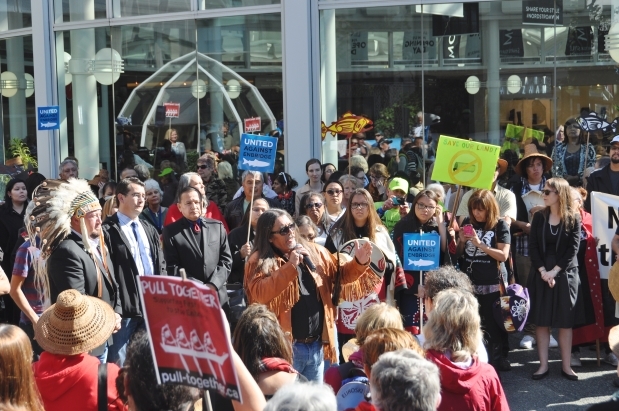 What happens now for Enbridge Northern Gateway? BC must now make a decision about issuing an EA Certificate to Northern Gateway, and the Court made it clear that it is open to BC to impose additional conditions on the project that are within BC’s constitutional jurisdiction in relation to the environment. The Court also required BC to consult with Gitga’at before making its decision about issuing an EA Certificate. While the Court’s order does not directly apply to other First Nations, West Coast’s opinion is that it should effectively require BC to consult with other First Nations that similarly stand to be affected by Northern Gateway, before making a decision about issuing an EA Certificate. By July 1, 2016, Northern Gateway must have proven firm supply contracts accounting for 60 percent of the capacity of both the proposed oil and condensate pipelines in order to begin construction. As of December 2015, Northern Gateway confirmed it has no firm supply contracts at all, citing uncertainty connected to ongoing legal challenges… Northern Gateway’s Certificates are due to expire by December 31, 2016, unless it begins construction. So what does it mean for Kinder Morgan? Like Enbridge, the Kinder Morgan NEB review is the sole Canadian regulatory process, thanks to the same Equivalency Agreement. That process in many ways, has been even worse than the Enbridge Joint Review Panel (JRP) process that is currently subject to judicial review – unlike the Enbridge JRP, the Kinder Morgan NEB process has not even included public hearings or cross examination, nor is it fully considering the impacts marine shipping. BC’s recent rejection of the project in their submissions to the NEB, was based largely on spill risk and inadequate spill response. Combine this with the Tsleil-Waututh Nation’s decision to withhold consent for the project, based on the findings of their own independent assessment, and there is no way the Province can claim it is not aware of the serious concerns associated with shipping nearly a million barrels of diluted bitumen from the tar sands through BC’s land and waters every day. The implication of the CFN decision is that the Kinder Morgan tankers and pipeline project cannot proceed without a provincial environmental assessment certificate, and that the Province has a duty to consult and accommodate affected First Nations before making this decision. That means, at the very least, that an EA Certificate is not coming any time soon, and that if it is granted may impose more onerous conditions on Kinder Morgan. The NEB has stretched the 15 month deadline to nearly 25 months, with the current NEB schedule calling for a May 20, 2016 recommendation to federal Cabinet (who will make a decision about the fate of the project). The CFN decision makes it clear that First Nations must be consulted by the Province about whether it should exercise its discretion to withdraw from the Equivalency Agreement (and do its own assessment) before the federal Cabinet makes its decision about the project and directs the NEB to issue a certificate for the project. Despite numerous calls to halt the NEB review, the maligned process is moving full steam ahead. Oral hearings, which have shut out the general public from attending in person, are scheduled to be held in Burnaby from January 19th to January 29th. In the meantime, the federal government has stated that the project will have to go through a further transition process while they fulfill their campaign promise to fix Canada’s broken regulatory system. The details of the transition process are purportedly coming soon. And last but not least, the Tsleil-Waututh Nation’s appeal of the NEB’s original hearing order will be back before the Federal Court of Appeal in Vancouver on January 22, 2016. The arguments made by the Attorney General of Canada on the duty to consult First Nations in designing EA processes and whether EA should consider the impacts of marine shipping will be telling about what Real Change™ looks like.